A leaking exhaust system can cause an increase in fuel consumption with the possibilities of exhaust fumes leaking into the passenger compartment causing sickness and drowsiness. 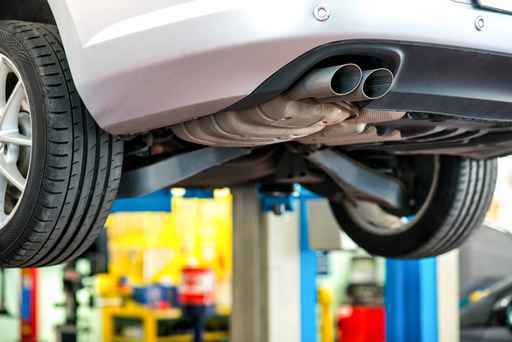 If you are in any doubt about the condition of your cars exhaust system VERWOOD MOT is always happy to carry out a free inspection and give you an HONEST appraisal of its condition..
We are able to obtain most exhaust parts within 1 hour from local suppliers. 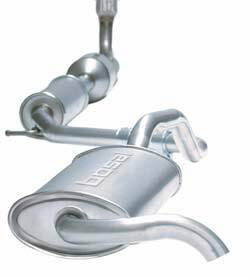 All our exhausts are covered by a one year warranty. We can also fit a new Catalytic Converter. Contact Verwood MOT Centre on 01202 827319 if you are experiencing exhaust issues. The Catalytic Converter (Cat) works by filtering the exhaust gas through an internal honeycomb section known as a Monolith or a Catalyst. This Monolith (made of either ceramic or metal) is coated with precious metals such as Platinum, Palladium and Rhodium that act as a filter for the harmful gases. Once the gas flows through the Monolith they are largely converted via a chemical reaction into non-harmful emissions such as water and carbon dioxide. The exhaust gas is constantly monitored by a Lambda Sensor that is positioned in the exhaust downpipe after the Cat. This sensor samples the gas and reports back to the Engine Control Unit (ECU). If there is not enough oxygen in the gas then the system leans off the fuelling very slightly.